9.7% lodging tax, not included. All canceled reservations received 15 or more days prior to arrival are subject to a 20% cancellation penalty. Reservations canceled within 14 days of the scheduled arrival date are subject to a penalty equal to the cost of 1 night’s stay. Pets are welcome in the Northern Territory and Knotty Pine dog friendly WA cabins ONLY. Guests traveling with their pet must notify the reservations team at the time of booking and are required to sign the pet policy upon arrival. There is a $30/night pet fee. 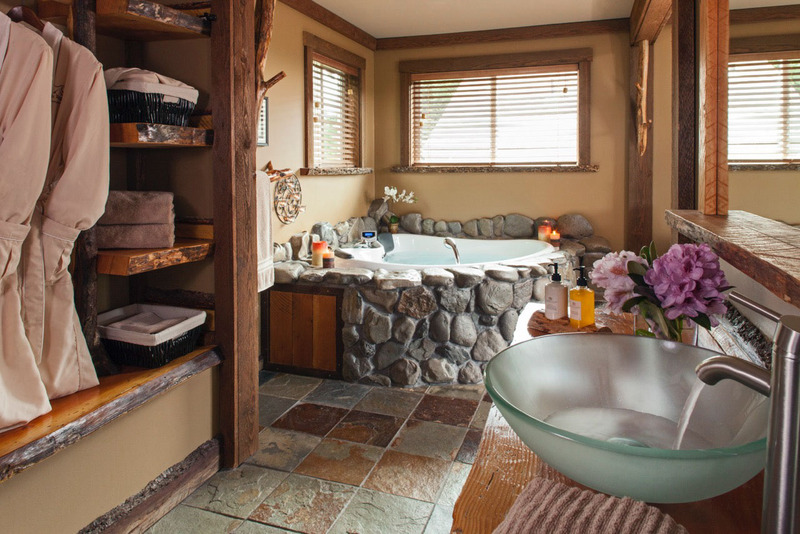 The Carson Ridge Luxury Cabins provide luxurious lodging for two guests. Your private cabin comes with a hand-carved log bed, luxurious linens, pillow top mattress, leather chairs to curl up in front of your fireplace, hydrotherapy spa tub for two or a jetted tub, a covered porch with a log swing and bistro table, plush bath robes, Gilchrist and Soames spa collection products, bath salts, candles, iPod docking station, satellite TV and DVDs, air-conditioning, mini fridge, microwave, coffeemaker and much, much more. All cabins are offered with a three-course gourmet breakfast and the option to have it delivered to your cabin. The property encompasses acres of beautifully landscaped grounds with hiking trails, a summer hammock garden and lawns suitable for weddings overlooking the views of the surrounding foothills of the Cascade Mountain Range. Witness your worries and the stresses of everyday life evaporating by enjoying one of the many spa options, such as a salt body scrub and wrap followed by a hot stone massage. You can experience the ultimate romantic evening by enjoying a lavender bath with your partner followed by a relaxing, side-by-side couple's massage, all in the comfort and privacy of your own cabin! There's also a great venue for elopements, intimate weddings and corporate retreats. This is the perfect place to escape from it all and reconnect to what is most important to you. Fully furnished cabins with a fireplace, jetted tub, Gilchrist and Soames spa collection products, plush bath robes, bath salts, satellite TV and DVDs, mini fridge and board games and cards. Just outside your doors there is a covered porch with a log swing and bistro table. Dogs are welcome at some of the units for an additional $30/night.